Click on on the link above to go over to Calleigh's clips and crochet creations for a wonderful giveaway! I cannot recommend this site too much! This site has changed my life. 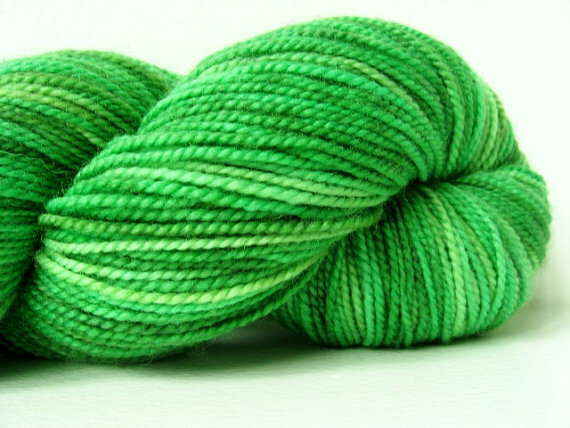 Kathryn is brilliant and reads hundreds of blogs and gives her links for the week, opinions, awards and giveaways. 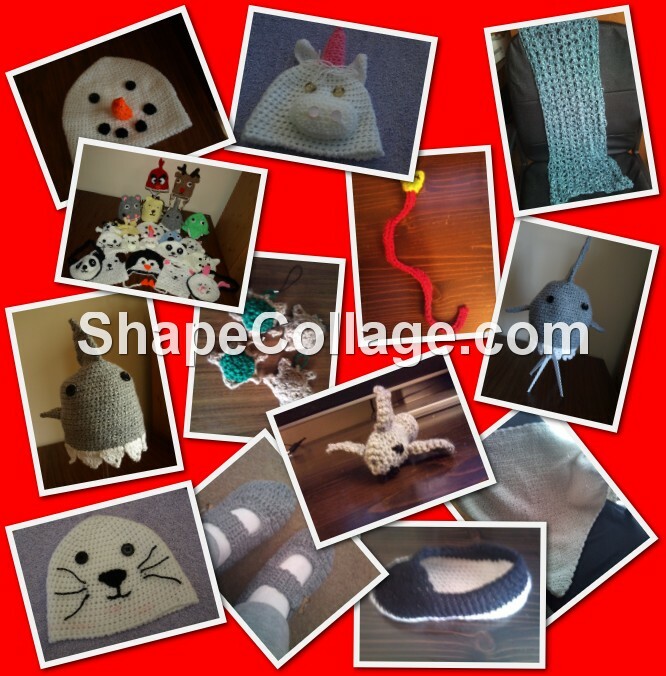 Whether you are new to crochet or not this blog has something for everyone! Please if you haven't taken a look previously please do and if you aren't already a follower join now it's really worth it! I wonder what 2012 will hold? 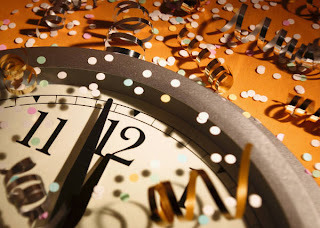 I can't believe it's nearly the end of 2011. 2011 has been such a big change for me. There have been lots of ups and downs but I finally feel like I'm in a place where I'm happy with me. 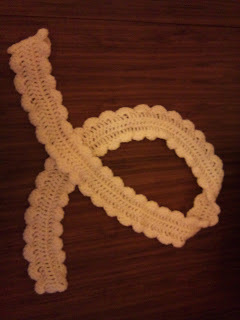 My CFS has been difficult and since being diagnosed in 2009 my condition has worsened but since finding crochet my mental state with the disease has been a lot better. 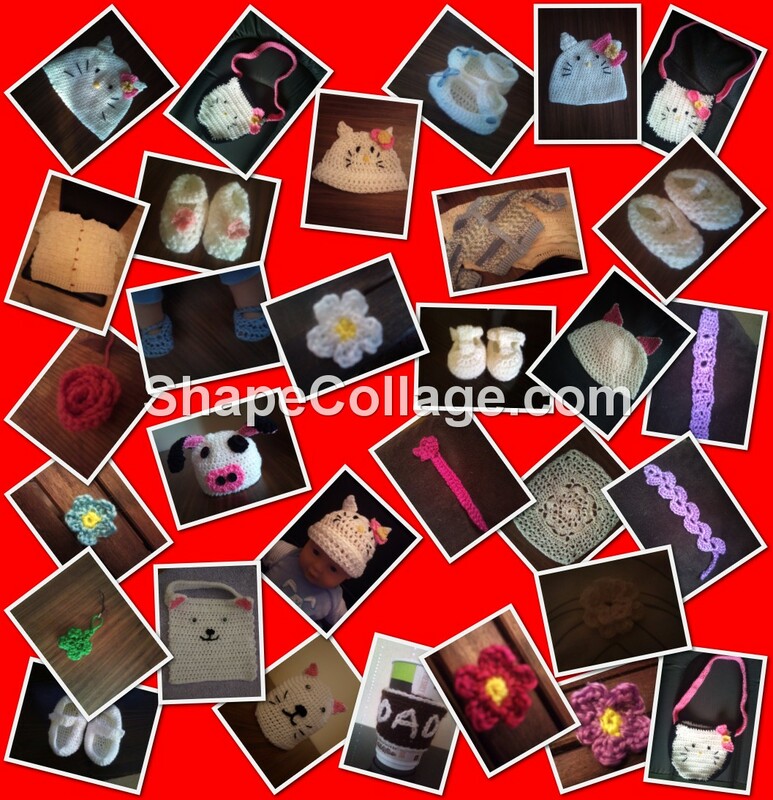 I would recommend for anyone with CFS to learn a new craft. You have to rest and when ever I did I used to feel like a waste of space. Now I can crochet I feel like I'm achieving things whilst I'm resting. It has made such a positive impact in my life and I couldn't live without it now. Well enough of me waffling it's time to get down to Finish Off Friday! I designed it myself and I must admit it has to be one of my favorite hats that I have made. 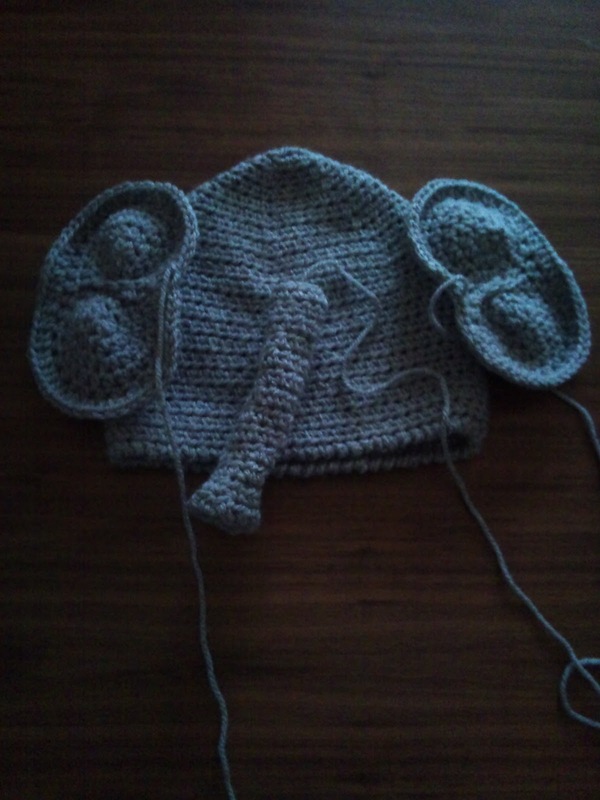 The jury is out on whether or not it needs a mouth. My father in law says it needs a bendy straw in his trunk so you can drink whilst wearing it? This will probably be my last post of the year so I just want to wish you all a Happy New Year and I will look forward to posting for you in 2012 and reading all your fantastic blogs. 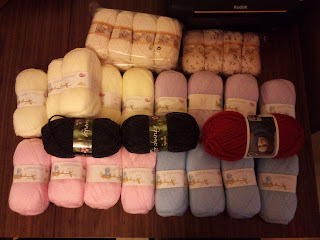 Thank you for making me feel welcome in the crafting world! 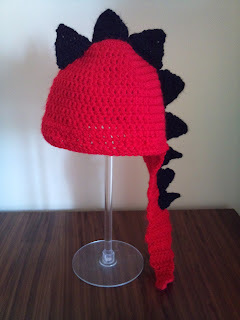 I am giving away some copies of my dinosaur hat pattern. 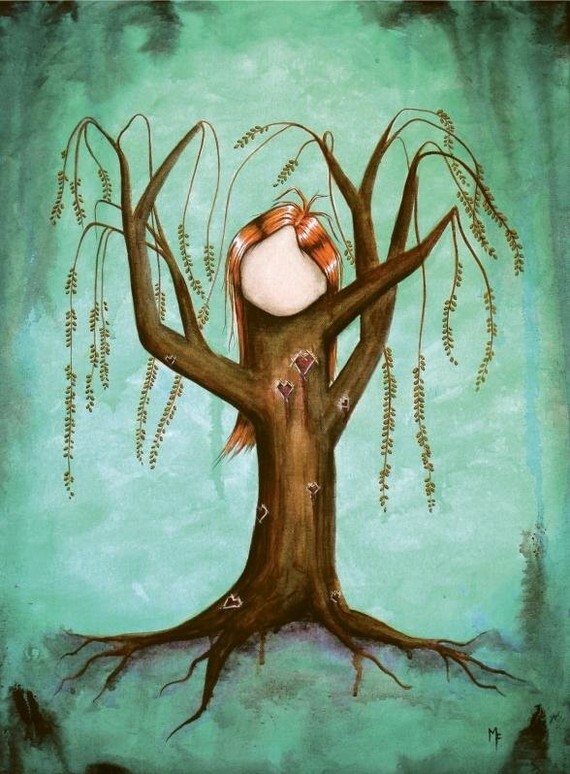 I wanted to say thank you to all my new blog followers! I also wanted to say a fantastic goodbye to 2011! And a great welcome to 2012! There are multiple ways to join. I will hopefully post the winner on Sunday. Please leave your email address so that I can contact you if you win. The winner will have the pdf emailed to them once the giveaway has finished. Today is a good day and I think you are going to be shocked by todays WIP. 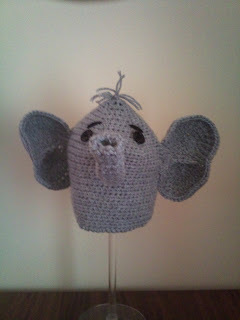 If you've read my previous WIPs you will remember my good old friend the elephant hat. Today will the last day that he will appear on my WIPs! Yes he is a step forward and I am hoping to get him finished today! I wanted to get him finished before the end of the year and I have managed it (I can't wait for you to see him finished on FO Friday). We are having a chill out time at home. hubby was back at work today so Ryan spent the day playing, watching movies. It was a perfect day after all the hectic goings on over Christmas. 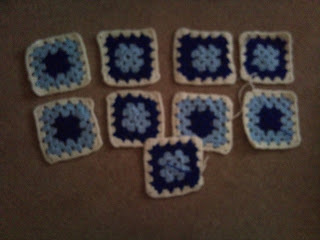 I have one more order to make and then I can start my crochet along's and my african flower hexagon blanket. 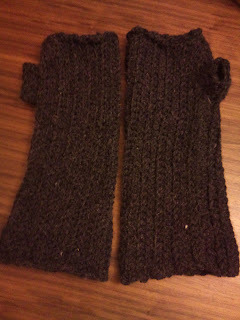 I also need to find the easiest mitten pattern as I want to make mittens for the orphaned children in South Africa. The orphanages home children who have lost both parents to aids. 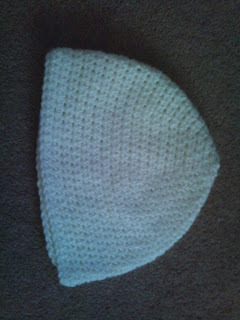 I have been in contact with them and they say they really need mittens and hats for the children in the winter. I am also planning on finding a simple teddy pattern and make some teddies for next christmas for them. So instead of making new years resolutions I am making a make it list. Are you making any new year resolutions this year/ making a make it list? First of all I would like to wish everyone a very Happy Christmas and a brillant new year! I made mine slightly longer (ch 41) and when I had finished stitching them together I did another 2 rows around the thumb. 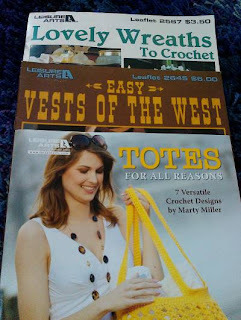 I have decided to expand my crochet knowledge and join some crochet alongs. I am only joining 2 at the moment as I also have a list of the things I would like to make this year. 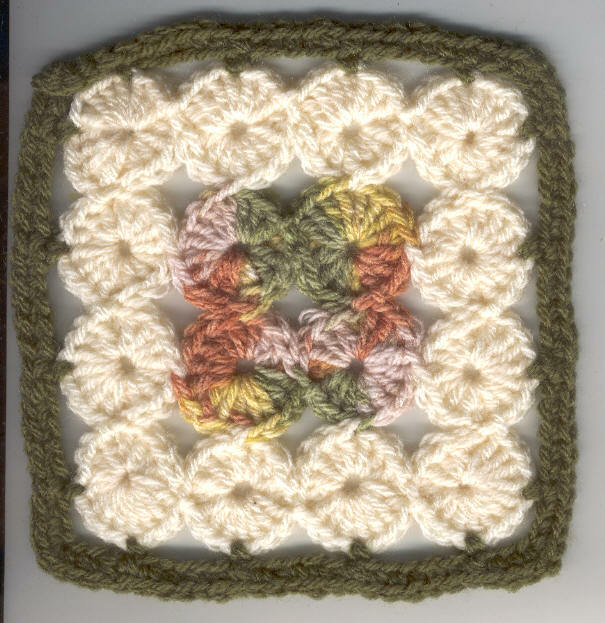 I have downloaded the pattern for my first 6" square. 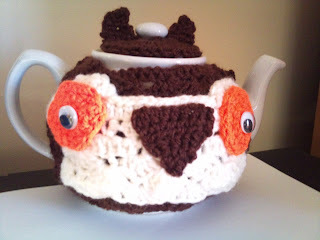 I am still going to design my new items that are animal themed. Make some/all of the items on my project list for 2012 and make any orders that come in. I will post once a month when I have completed the block with pictures and if you join in please feel free to update us all how you are doing. Well I'm off, going to finish an owl ornament and then it's off to bed for me. I hope you all had a fantastic Christmas and got everything you wished for. Wow can't believe it's Christmas Eve tomorrow. 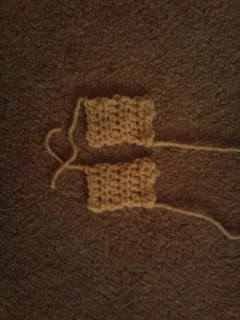 I've nearly finished my christmas presents but not quite. 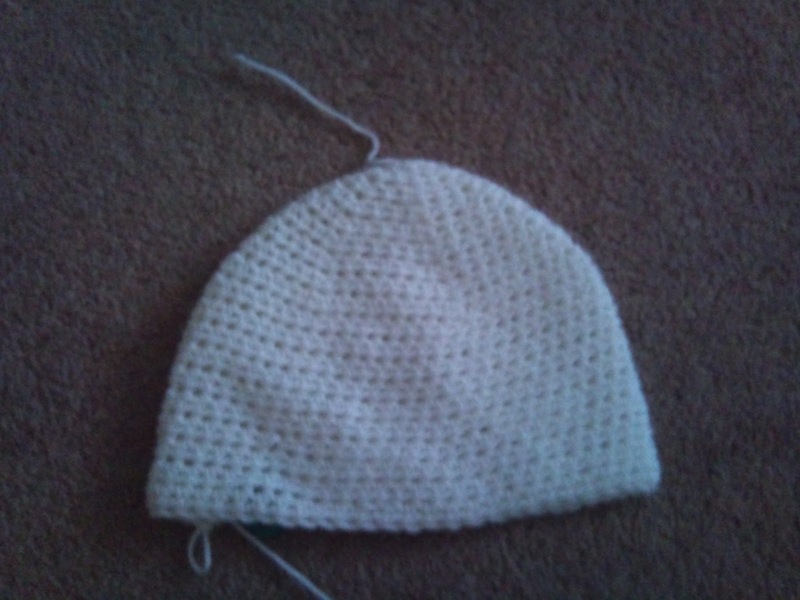 I finished one for my son today but as he wasn't well he got it before christmas. He only has a cough and a cold but it's not nice to be under the weather at christmas. It isn't my best work as it's a bad cfs week but Little Red (my son) loves him. 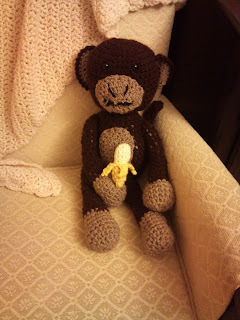 I even put the banana on a button so that little red can take him off the monkey if he wants. It's my brothers 1st christmas with his girlfriend. 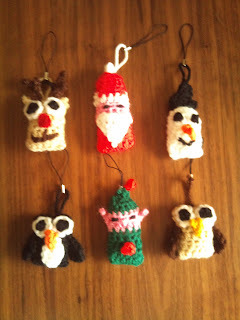 To celebrate I'm making them a full set of my christmas decorations. 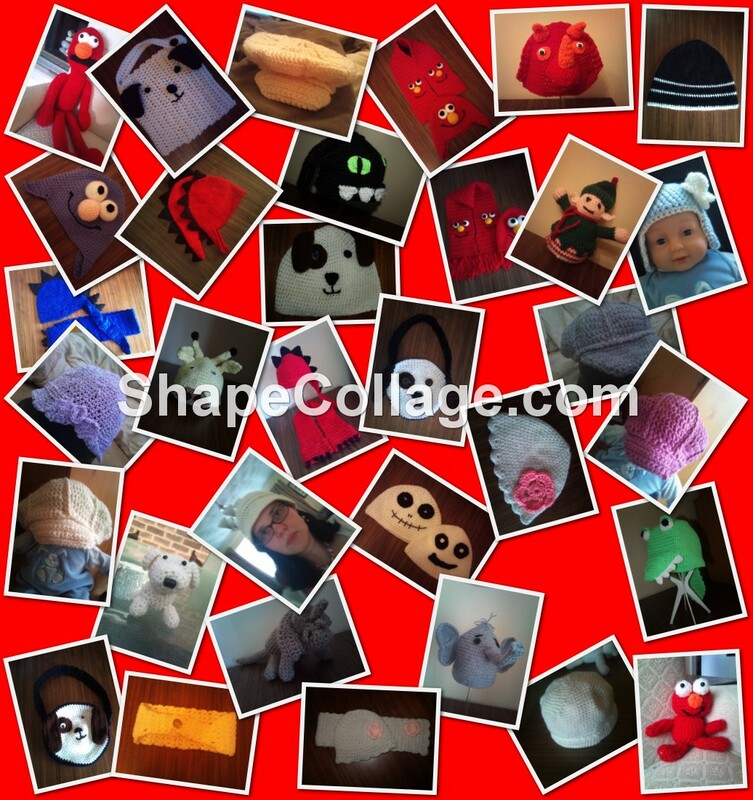 I've got some of them made just got a few left to go. Below is a picture of what they should look like when I've finished. This will be my last post before Christmas so I hope you all have a wonderful time. I hope your time is full of love and family! I would like to say thank you to all my readers. This year I learnt to crochet (feb), felt very isolated and then learnt about a world full of a new accepting family. You have filled my life with joy and made such a difference! Now whenever someone small minded makes fun of me making things I just laugh. I now understand it's them that is small minded and missing out on a fantasic life! I can't wait for the next year and reading about all the wonderful things you are doing! Well I haven't got much to show you this week. 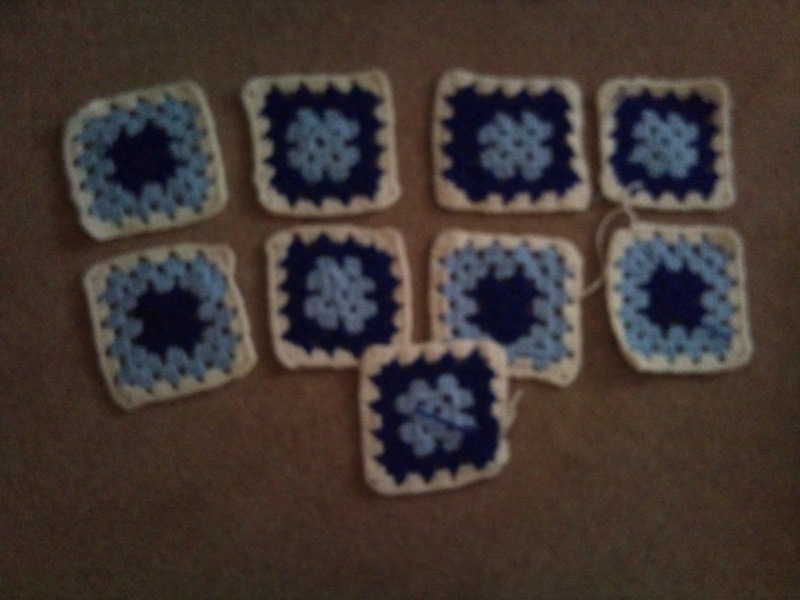 With it being so close to Christmas I've been trying to finish as many as possible and get them wrapped. 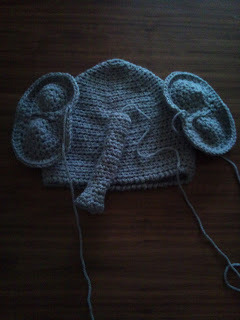 I do still have my elephant hat that isn't finished. I'm going to try and get it made up before the year is finished. 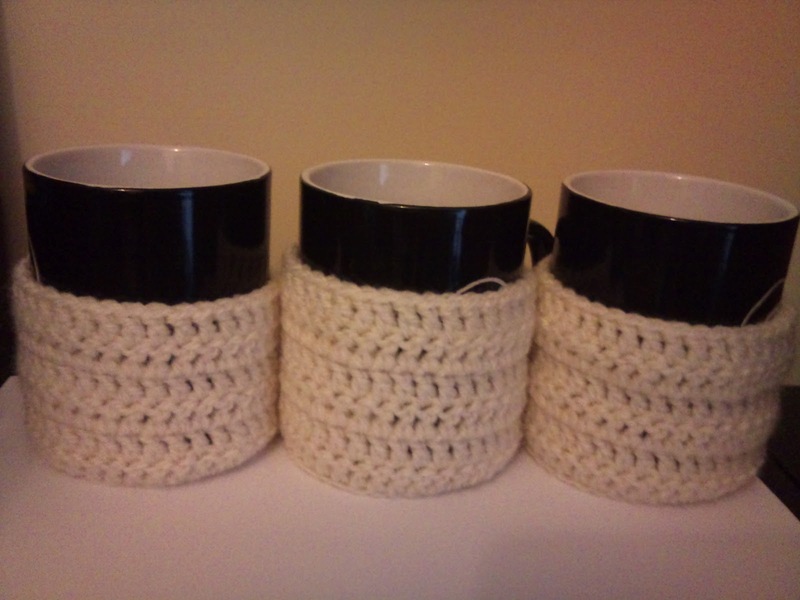 I don't have a picture but I made Ryan's teacher and the lollipop lady a mug cosy and bought a mug for each of them to go on. 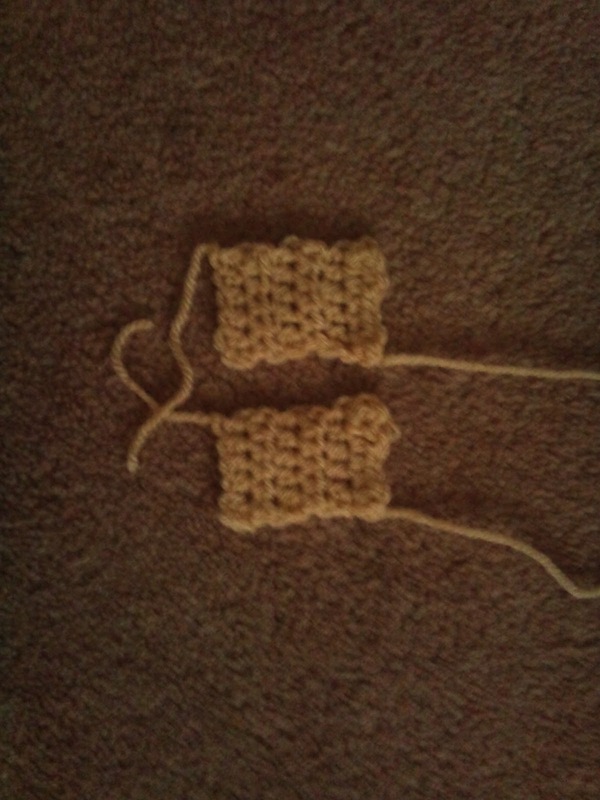 I do have a picture of the ones I made for the men in my family. I made one for my dad, my husbands dad and my husbands step-dad. I hope they like them. I'm sure they won't, my husbands family don't seem to appreciate hand-made gifts the way mine does. I love this pattern, very easy to follow and perfect size! Last but not least the scarfs that I have made for the women in the family. One for Ryan's Auntie Sara, My husbands Mum and his dads partner. For my first year of making presents I don't think I'm doing too bad. We are hoping to start earlier next year and maybe make things for hampers from scratch as well. 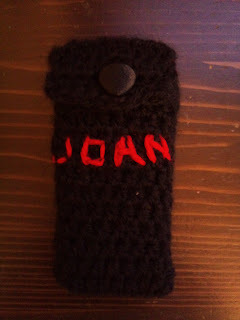 I think it means so much more when you have taken the time and effort to make a gift. We do have one gift to finish. we bought one relative a big biscuit jar but before we wrap it we are going to make a load of cookies to fill the jar. 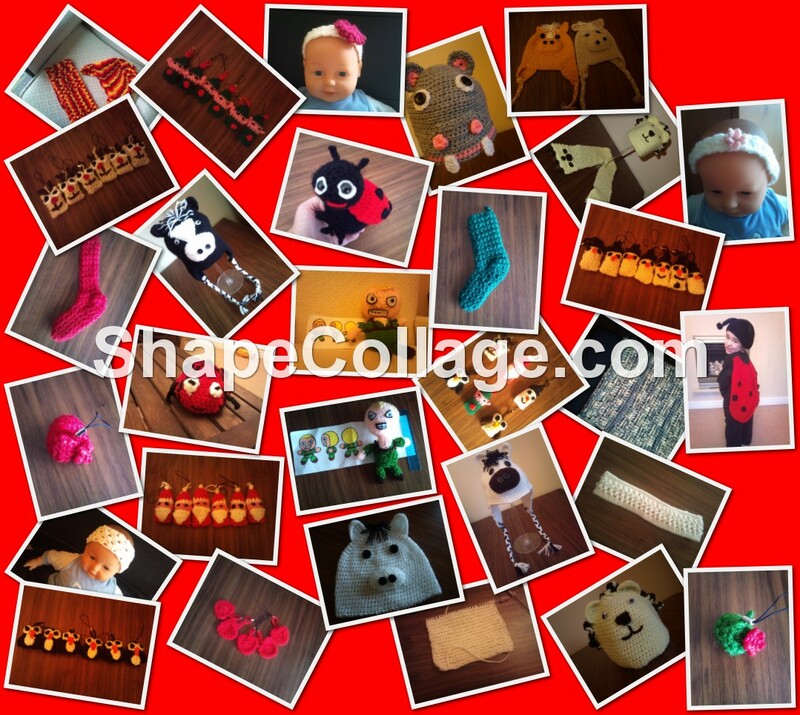 I hope your christmas gifts are coming along well. If I don't get time to post before Christmas I hope you all have a good one. Thank you to all the people who have left comments you have made me feel part of something that is wonderful. At last I have found a place where it's ok to make things! 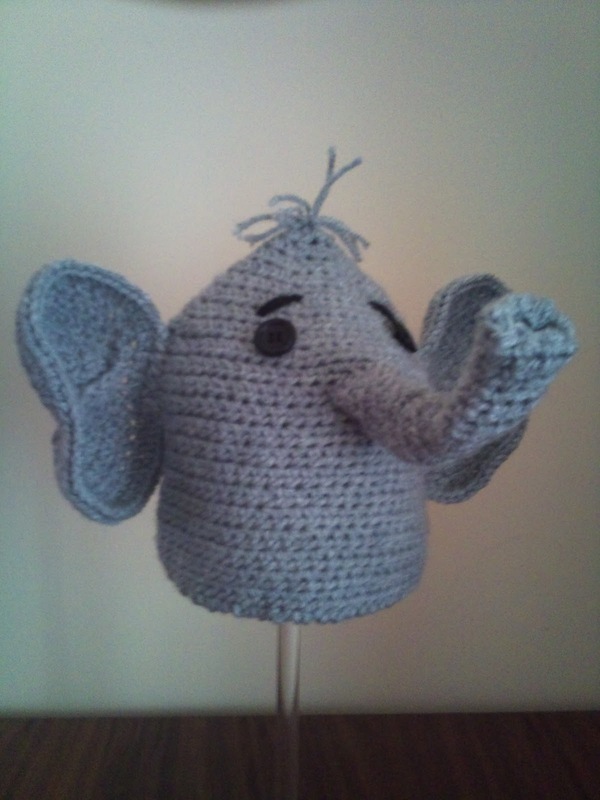 It isn't perfect and if I made another one I would alter it slightly but I hope my mum will like this one anyway. Sponsored by Rose from Cakewalk Yarns. 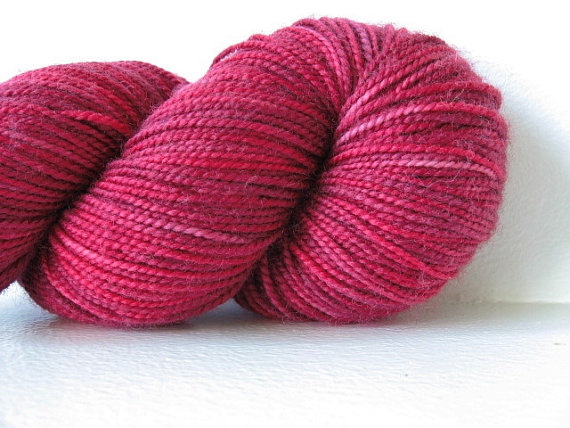 A little handmade shop filled with the most delicious hand-dyed yarns! Get on over and join in! Doesn't look much but round here the roads go to a stand still with the slightest snow. Now to the things I've been making this week. Sorry I didn't post any WIPs but I'd finished everything that day. 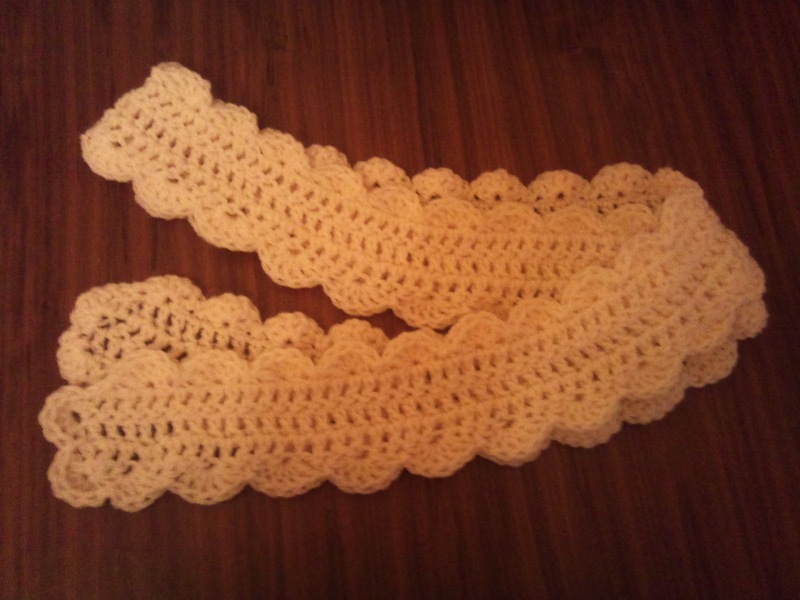 I've made 3 of these scarfs as presents for the ladies in our family. I hope they like them! The pattern is really easy to follow. I made mine with aaron and made it slightly shorter but I really like how they have turned out. 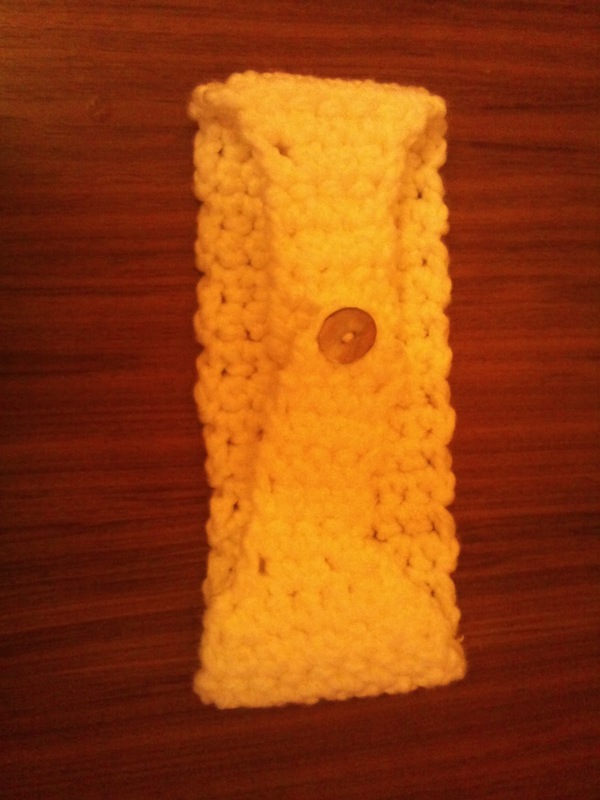 A friend wanted a phone holder for her mother-in-law. This is the first one I've ever made and I think it turned out quite well. 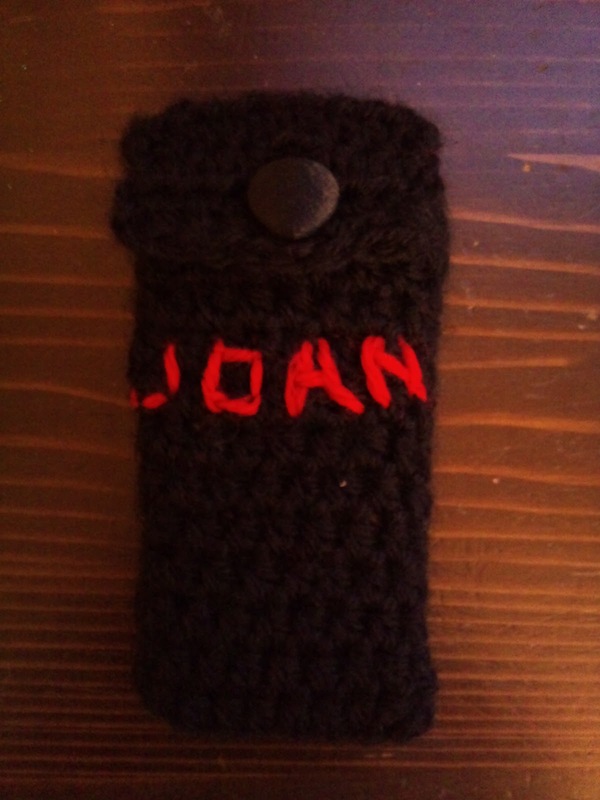 I hope she likes it. 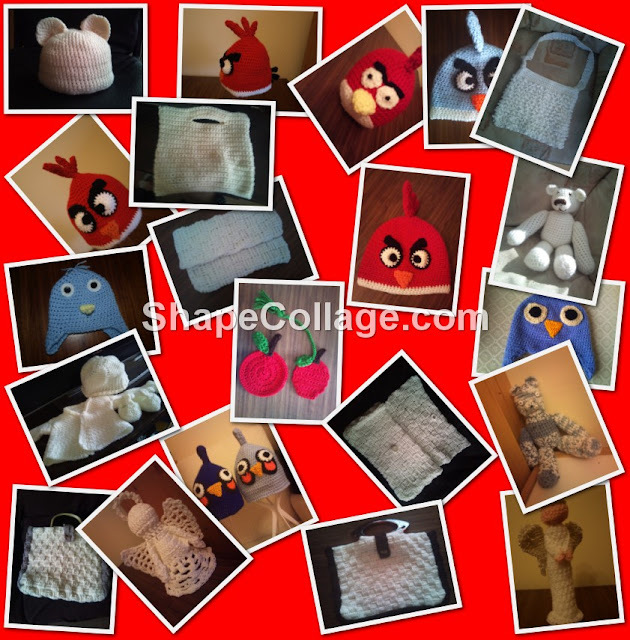 It's a fantastic pattern to follow, very easy and step by step photo's to follow. Hope you like my FO's. I'm off to go and make a tea cosy for my mum for christmas. Each post you get to learn about wonderful patterns free & $$ that Tara has found. 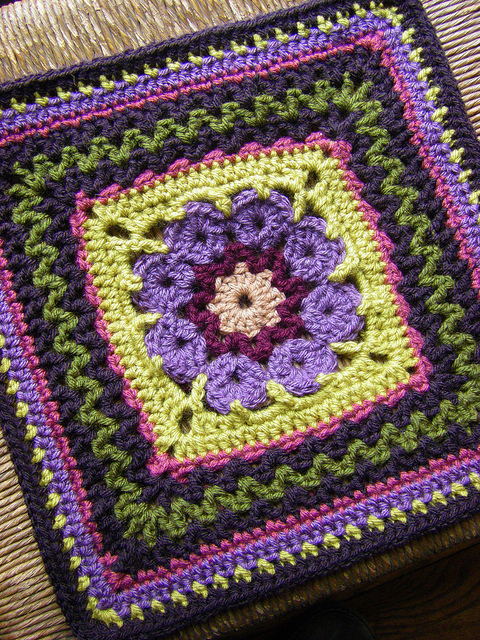 The patterns she finds are fantastic and the site it well worth a look. I have already joined and look forward to each post. Crochet Concupiscence is having a fantastic 31 days of giveaways. 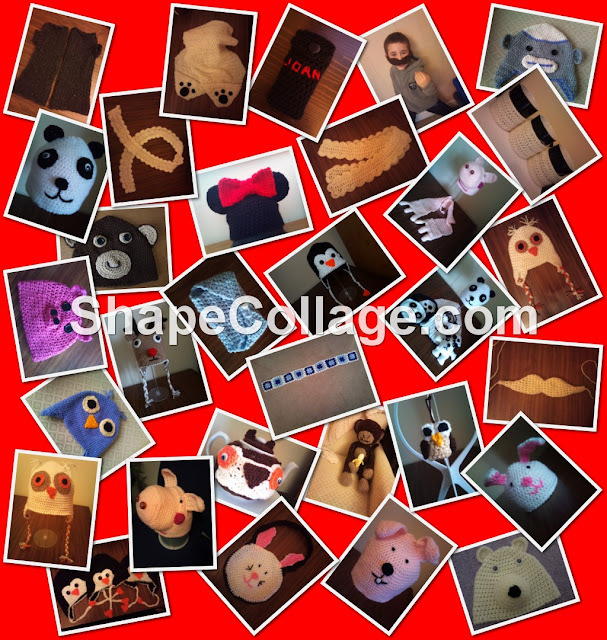 Found another fantastic giveaway, go on over and see if you can win! I want to start in a different way this week. I want to look at positives in negatives. As you all know I suffer from C.F.S. (Chronic Fatigue Syndrome or M.E.). There are lots of negatives that go along with this disease. I may have had a stomach bug for a week and now my kidneys are grumbling but I have found a number of positives this week. I went to an appointment with the nurse this week, everyone was dashing about around me, rushing to the next thing they have got to do. As I wasn't able to rush about like them I took my time and noticed the blackbird singing in the tree across the road. I noticed the moth that had died but left a beautiful pattern with his body. Although the sky was grey and looking nasty there were soo many different greys within them that it was amazing. I have also noticed how crochet has changed my life and given it so much more meaning. I always arrive early for appointments (something I get from my dad but not quite to his level) which means I spend a lot of time in doctors and hospitals. I looked around me whilst waiting and saw people bored. Some were looking at magazines they really weren't interested in, others were staring into space and others chatted with who ever they came in with. I realised as I sat there how productive I was being. 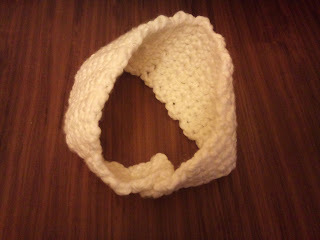 I take my crochet with me to all my appointments and find it useful to make something while I wait. Some people look at me like I am strange but I don't mind anymore, as I sit there I am making something that someone is going to love and enjoy, what could be better than that! I took some time off work this week as my son was ill and isn't allowed back to school for 48 hours after symptoms have finished. Ryan just wanted to play with his toys so I spend some time crocheting. 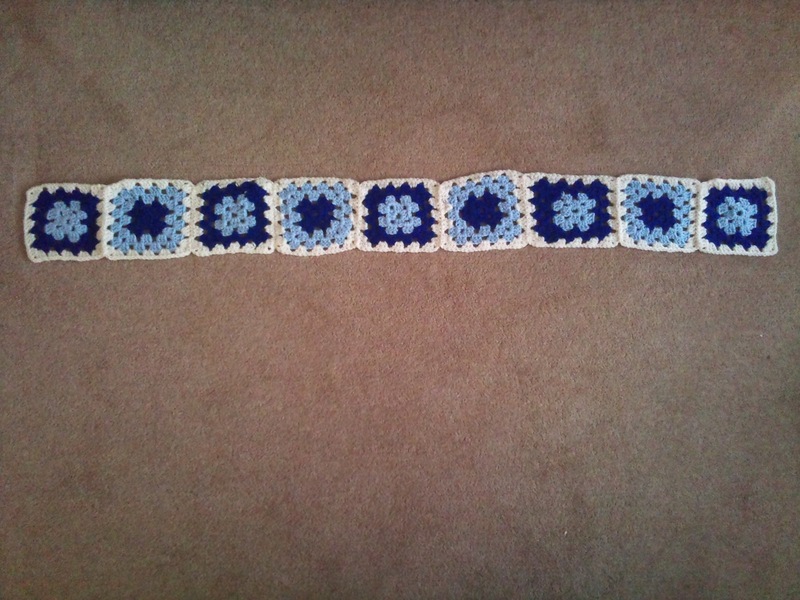 I made a granny square scarf for my Gran for Christmas. It's a lovely easy pattern to follow. 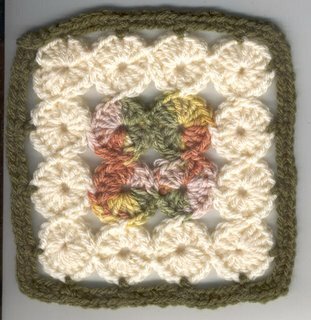 I might make a throw using the pattern in the future. Really easy pattern to follow. 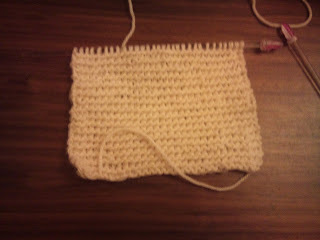 I shortend the scarf slightly as I thought it would be too long for the person I'm giving it to. I also treated myself. 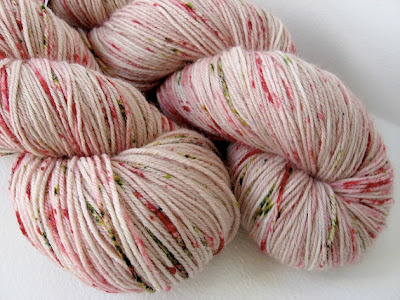 I bought a knitting magazine (yes I'm thinking of learning to knit) and it had some free snow berry chunky yarn on it. They were only small balls but I really wanted to make something with them. Hence something for me :-). 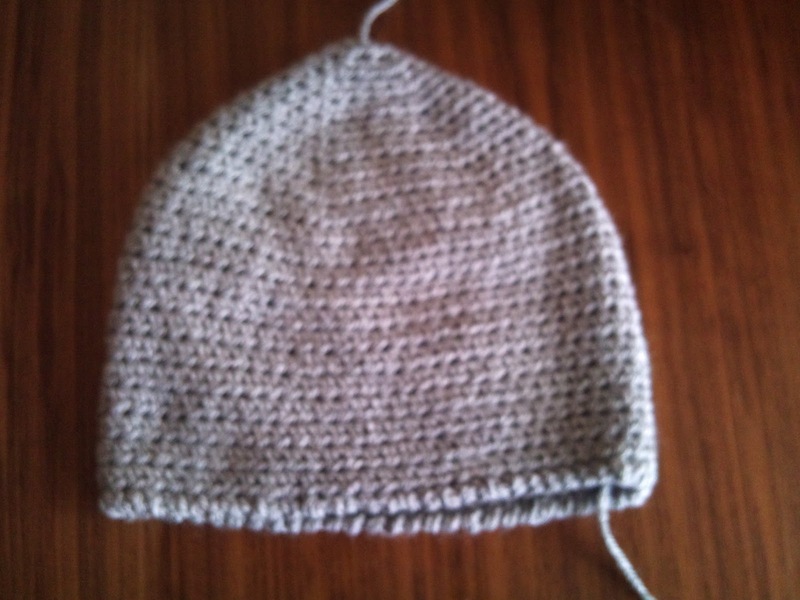 I didn't use a pattern I just made it up as I went along. 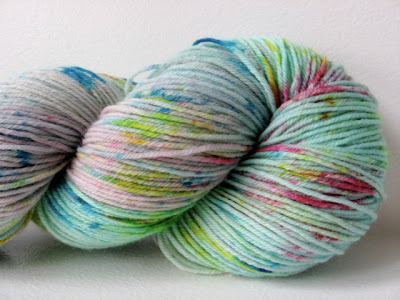 I hope you are all having a good week and a good FO Friday. 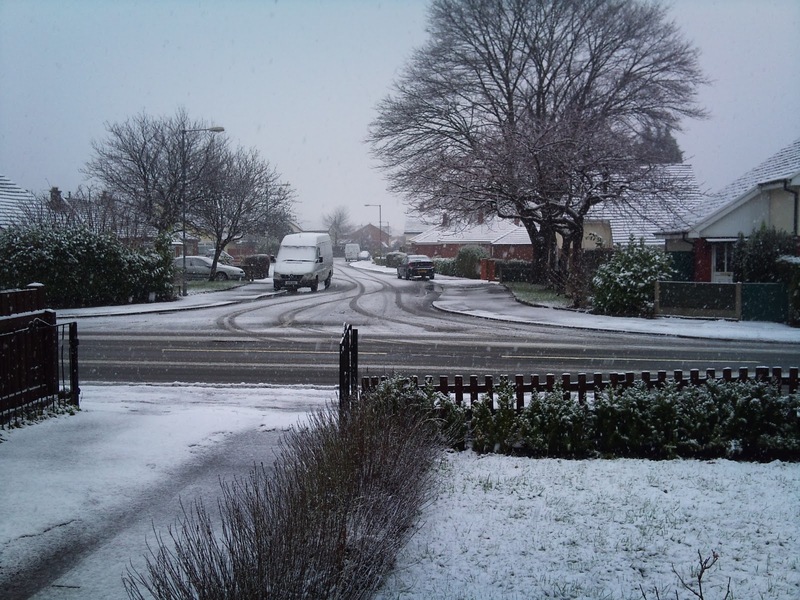 Don't forget to take a look at some of the others FO Friday blogs. Head on over by clocking on the header for another wonderful giveaway! 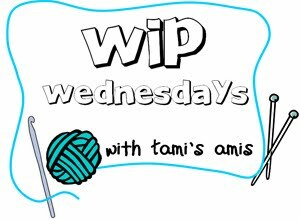 If you would like to see some other wonderful WIPs click on the link above. 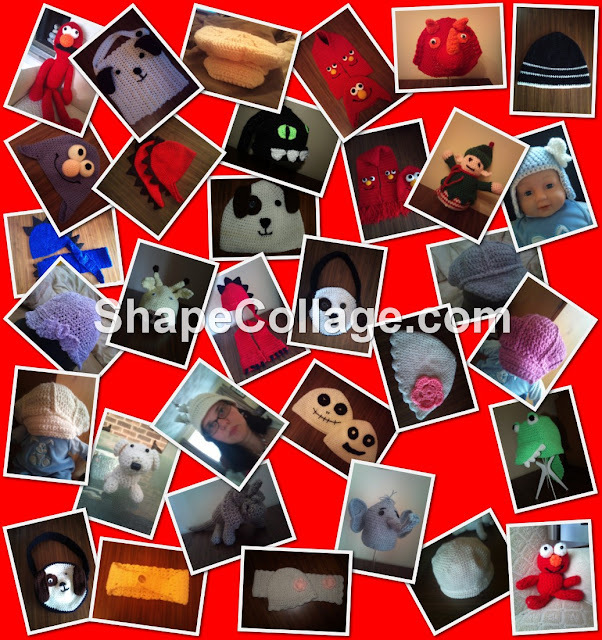 I've got quite a few WIPs this week as I'm trying to get some of my Christmas presents made. Yes my elephant hat is still outstanding. I'm starting to feel sorry for it. 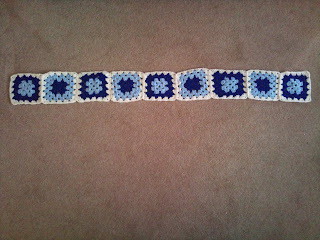 This is going to be a granny square scarf for my gran. I've got a bit of a dilema this week. My mum has asked me what I want for christmas. Not sure whether or not to get crochet books, magazine subscriptions or some yarn for a special project. Hope you are having a good Wednesday!